Did you ever think that it was possible to teach the intangible value of recycling to very little kids to possibly make a difference in their future? Keep in mind the proverb, "it's the little drops of water that make the mighty ocean." So, in the crisp fall of 2004, I had a seed of an idea that blossomed into the "Recycled Holiday Ornament Contest." This contest was aimed at young children pre-K through fourth grade! They would be challenged to make "environmentally friendly ornaments" out of things that would usually be thrown away. The contest has since received local, county, and state support. It has morphed into this educational activity, with many benefits, and it even has a trash mascot. It's highly anticipated by not only the primary school students, but by the parents, school faculty, and the Village Mayor; but has it had any impact on the kids? Right from the start, on the local level, the Oxford Holiday Committee, a group that organizes a Village Tree Lighting, enthusiastically gave their support and provided prizes like pizzas and ice creams. "Miss Nancy" Cody, my friend and teacher's aide, helped me make a presentation at our Oxford Academy Primary School. Some faculty has changed over the years, but the school's art teacher gives the students ideas on repurposing discarded materials, and Renae Ruff, the librarian, displays and suggests books on the "3 R's"- Recycling, Reducing, and Reusing. (This has the added benefit of promoting reading). The website, OxfordNY.com displays photos of the ornaments, and the Village's arts and entertainment venue, 6 On The Square, graciously provides a month of window display space for the ornaments too. On the county level,Patricia Pittsley, Waste Management Program Assistant from the Chenango County DPW, has been a guest speaker at the school. She's given the kids a few quick facts on garbage reducing. On the state level, Debbie Jackson from the DEC, confirmed that this contest was not just a first for Oxford, but that no one had ever held this sort-of contest in New York State before! She provided oodles of pencils (made from recycled money) and educational booklets that the children loved. Later on, she gave other wonderful incentives like recycled plastic mugs and tote bags, and Conservationist for Kids magazine as prizes. This support really made the contest a winner! Next, it was up to the students to find some cool trash, and then get creative. Looking back at the charming ornaments, there have been some incredible examples of ingenuity and artistic expression. Trash has been turned into beautiful angels, treasured Christmas trees, Santas, and the like, but there have also been less 'traditional' ornaments. Cute penguins, tiny fairies, fanciful dancers, clever bi-planes and trains, funny little people with googly eyes, and sparkling abstracts to name a few. The exceptional re-use of materials such as Styrofoam peanuts, plastic jars (including the now defunct 35mm film cans); old CDs, etc. were really impressive – and all kept out of the landfill. The recycling concept wasn't lost; they "got it" and, since it was an at-home project, their families "got it" too. Everyone has been getting in on the fun. The local Head Start preschool has had their 3 and 4-year-old students make ornaments and the high school even had some students make a recycled sculpture. 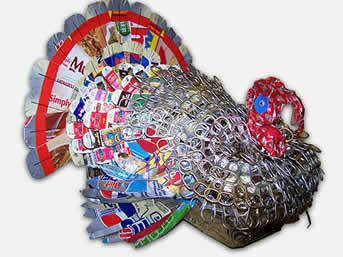 I made a life sized turkey out of garbage named "Trash Tom," a -recycling mascot- for the primary school's media center. Starting in November was perfect timing too! The contest dates overlap New York State Recycles Day and America Recycles Day, both on November 15th. The honorable Village of Oxford Mayor, Terry Stark, officially proclaims November as "Oxford Recycles Month" every year. At the end of the month, during the Tree Lighting Ceremony, the Mayor announces the contest winners- it's a very exciting moment for the kids. One more benefit came to light. It concerned me that the very young children were turning in ornaments that were well beyond their years, obviously because of parental involvement. Not having an education in education, I saw this as a problem. The school faculty, however, assured me that I should encourage the parents to help because the parent-child relationship was being enriched! Another bonus! Eleni Spyratos, was only in second grade in 2006. It was the third annual contest, and she made an impressive "Grinch Tree" primarily of old keys and used spark plugs bonded together. The sculpture weighed a ton, but the originality was fantastic and she won first place for her grade! Eleni said she still has the piece today; the true definition of "upcycling." Student, Andrea Dempsey, recalls the fun she had all through primary school, "I remember making ALL the ornaments with my mom." Andrea added, "I think the contest provides a fun way for children to start the practice of recycling and to continue to do so." Highly impacted, Andrea was even superhero, "Recycle Girl" for Halloween in 2010! Since the contest started, there have been great advances in recycling but we still have a long way to go. After more than a decade, we're celebrating the success of the children's creativity and imagination, but the contest itself is also a success. I don't think these young children are 'pondering the fate of the Earth' because they made an ornament from a plastic yogurt cup, but they may not look at plastic the same. Maybe they'll even drop less trash in the bucket. Mission accomplished!